Our 1991 Year of the No-Hitter coverage will always be a work in progress. 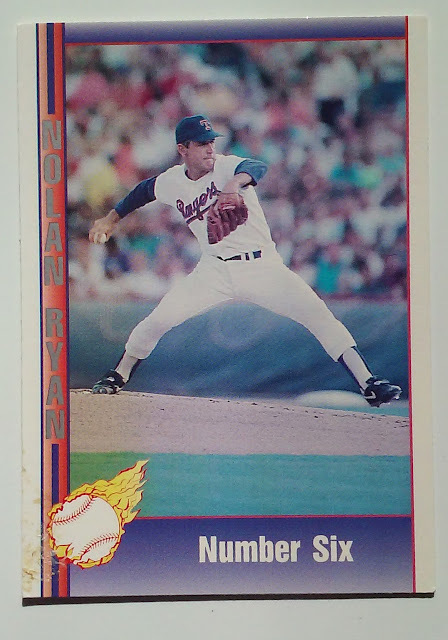 I started the series focusing on the 1991 Score No-Hit Club subset, but it has become more interesting as I have found other cards related to that years no-hitters. 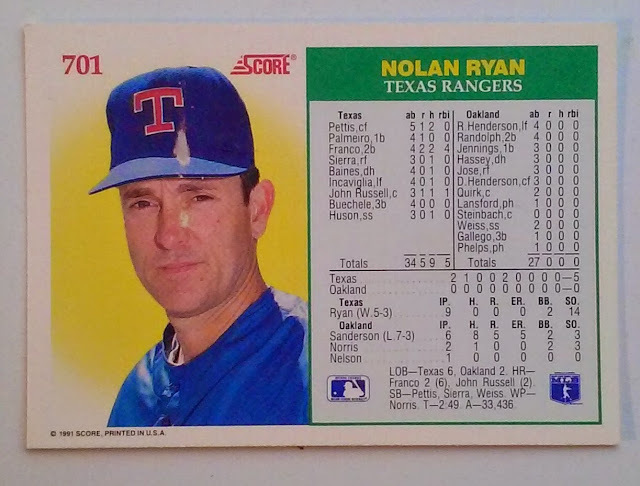 Pet peeve here as Nolan Ryan is clearly shown in a Home Rangers uni rather than a Road Texas jersey which he would have been wearing the night that he no-hit the Oakland A's. 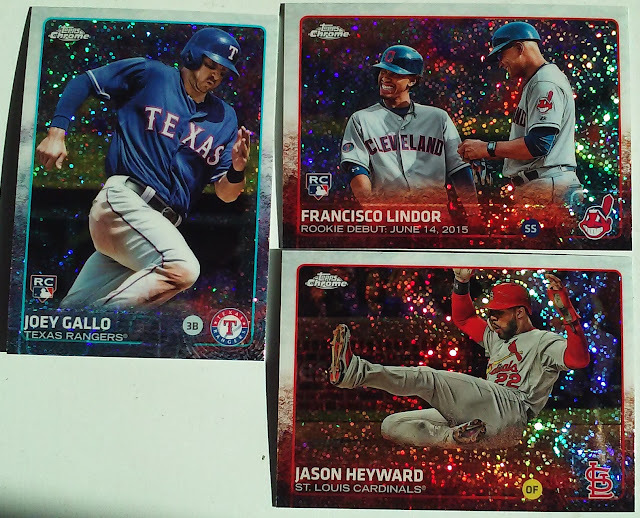 We have featured four other cards on Ryan's 6th no-hitter and all four card companies got the threads correct. 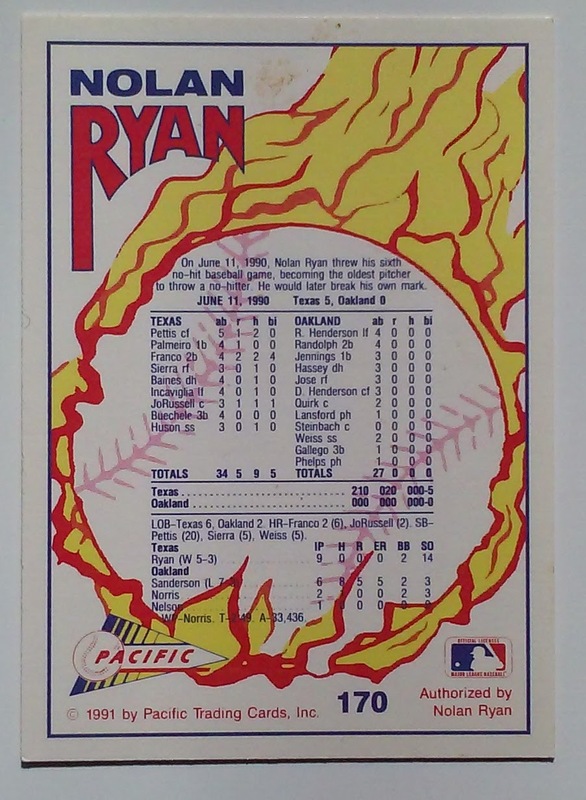 1992 Pacific Nolan Ryan is a continuation of the 1991 set that Pacific put out the previous year. Each of the two sets are similar in design and consist of 110 cards. The flip contains the box score with a two sentence synopsis of Ryan's achievement. Of the four previous cards we featured on Nolan Ryan's 1990 gem only one included the box score. The 1991 Score No-Hit Club Card. While formatted just a bit differently the two box scores cover the info at the same level of detail. 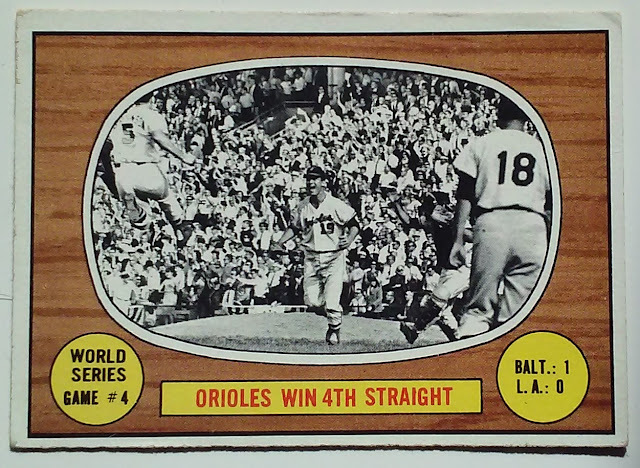 The Date is given on the Pacific Card, while it is only on the front of the Score card. We lead off our Swag posting with a rare Freddy Galvis card. 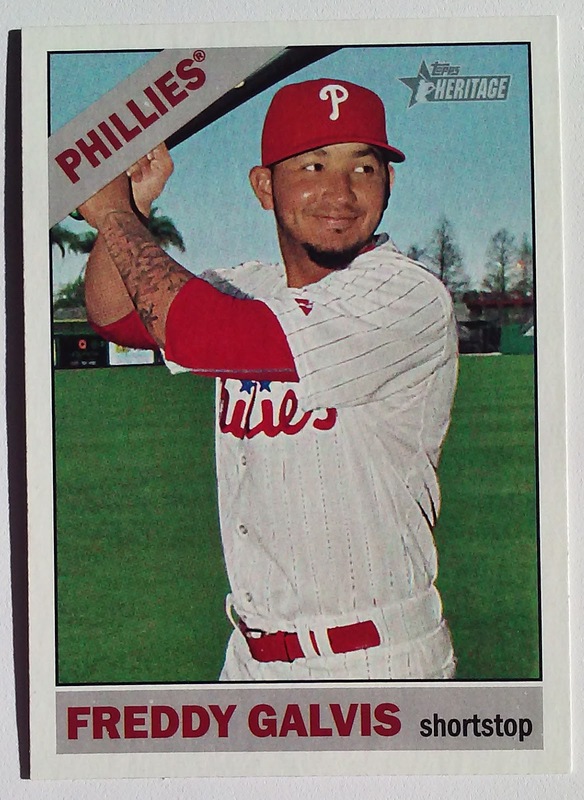 Topps seems to snub Galvis for some reason. He is not exactly a star and really more of a reserve player, but he is right at the top of the list of Phillies that don't get Topps cards. 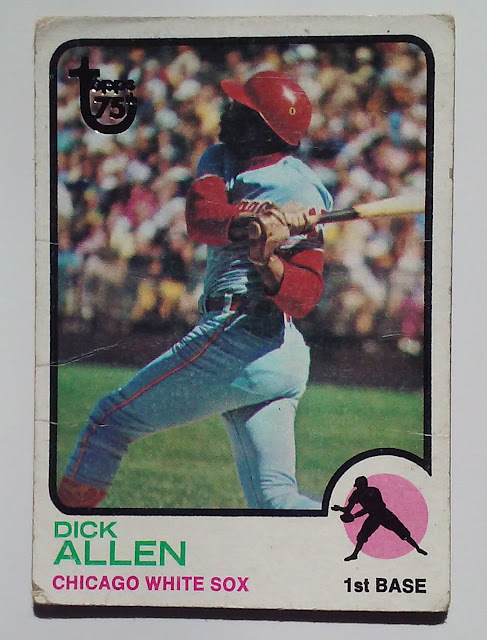 This card is from the Heritage High Number set, likewise #596 was a high number in the original 1966T but it did not correspond to a Phillies player. The original card was as Rookie Card issued to Nate Colbert with Houston. I was unaware that Colbert debuted with the Astros until I saw the RC. 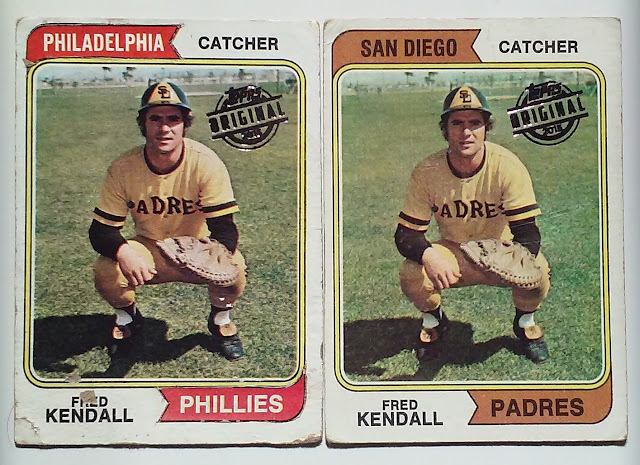 He eventually moved to the Padres as an expansion draft pickup. 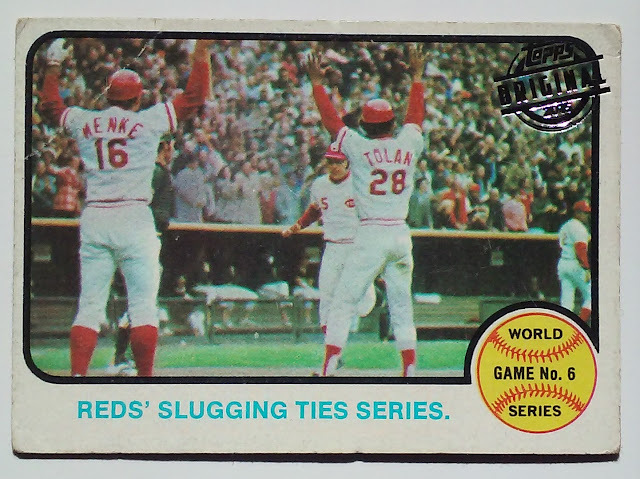 Colbert shares his dual RC with Greg Sims who had a grand total of 7 career MLB Plate Appearances. He's gone and may have to sign a minor league contract to hook up with a team in 2016 but that won't stop us from being fans. Nice to pick up this short print in the break. There are not a lot of cares of Phan Phavorite Wilson Valdez. 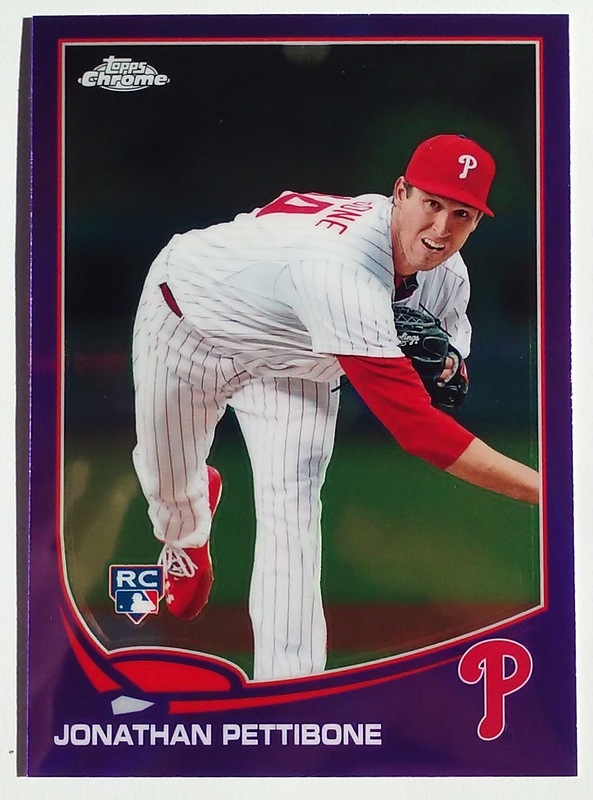 Pettibone had Shoulder surgery during the summer of 2014 and was expected to return to the Phillies by spring of this year but never made it to the mound in an official game. He is not currently on the 40 man roster. 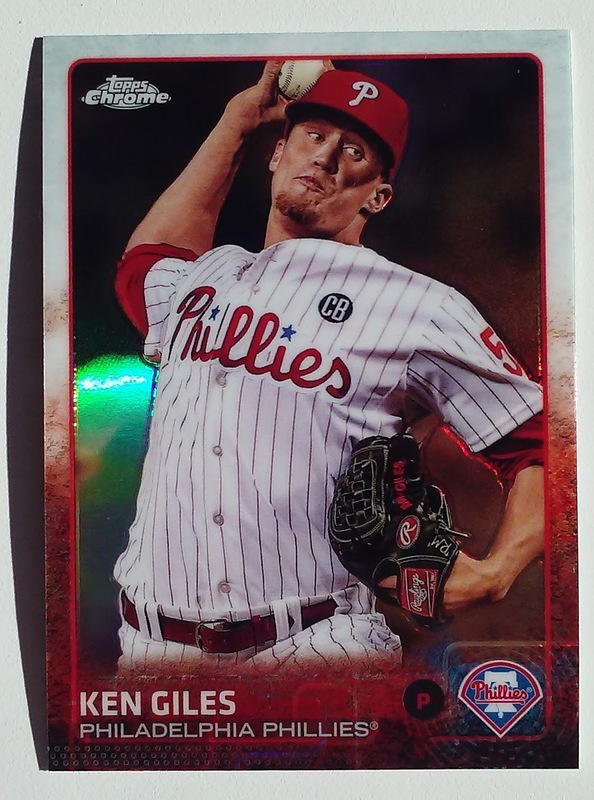 One of the few bright spots for the Phillies the last few seasons has been reliever Ken Giles. With contenders looking for closers and the rebuilding Phillies not reall needing one there is a chance that Giles will be on the move this winter. The Phillies rule 5 pickup Odubel Herrera also provided a few highlights during the Phillies 2015 campaign. 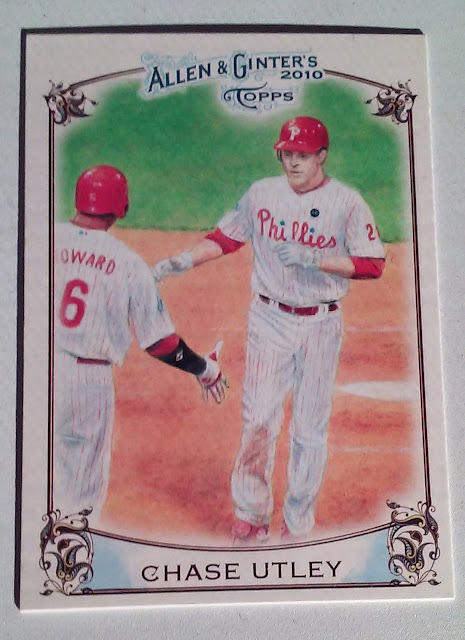 Still good to see cards of one of the 2008 Phillies last remaining heroes. Closing with another Chase Card. It isn't as exciting as the postseason or even the regular season but Awards Season is upon us. This will all culminate with the Hall of Fame Voting in January. 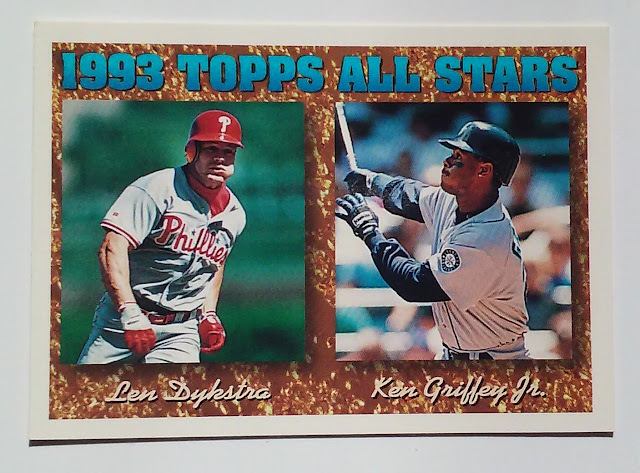 There are 15 new names on this years Ballot, none bigger than Ken Griffey Jr.
We will all likely see a lot of cards of Junior over the next couple of weeks. 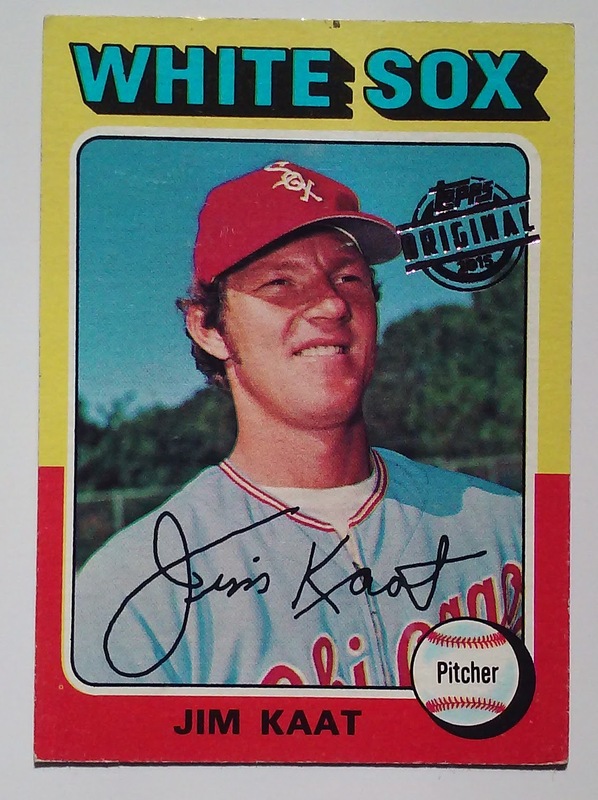 This is a fun one that also happens to feature the Phillies centerfielder of the era Len Dykstra. Something tells me that Griffey's HoF ballot count will be significantly better then Dykstra's sole appearance - the 2002 ballot. Lenny received a single HoF vote, which is more than he deserved. I did a few searches but was unable to find the BBWAA that voted for Dykstra. 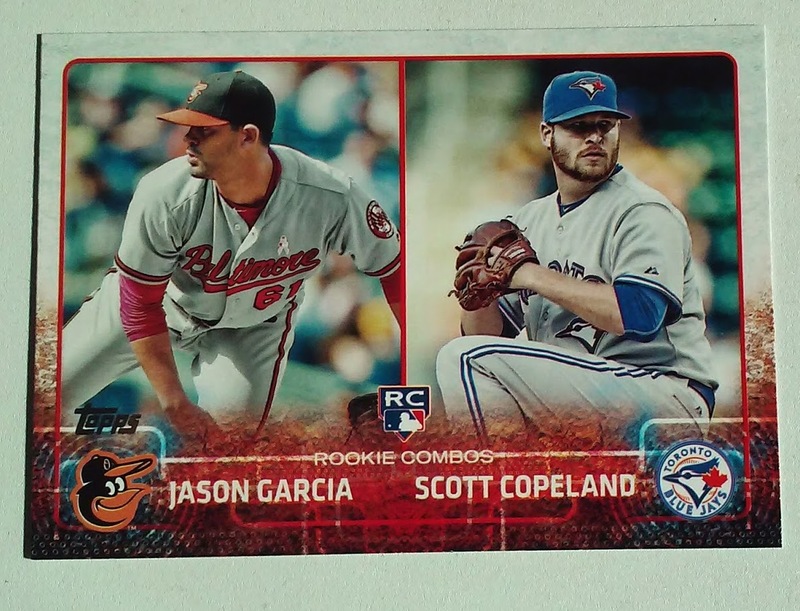 It is almost comical to think of he and Junior getting equal billing on a card. For the most part I think Griffey is one of the most well regarded professional athletes while Lenny is pretty much viewed as a cretin. Kind of a cool idea for an All-Star card with the pre- and post- break stats. 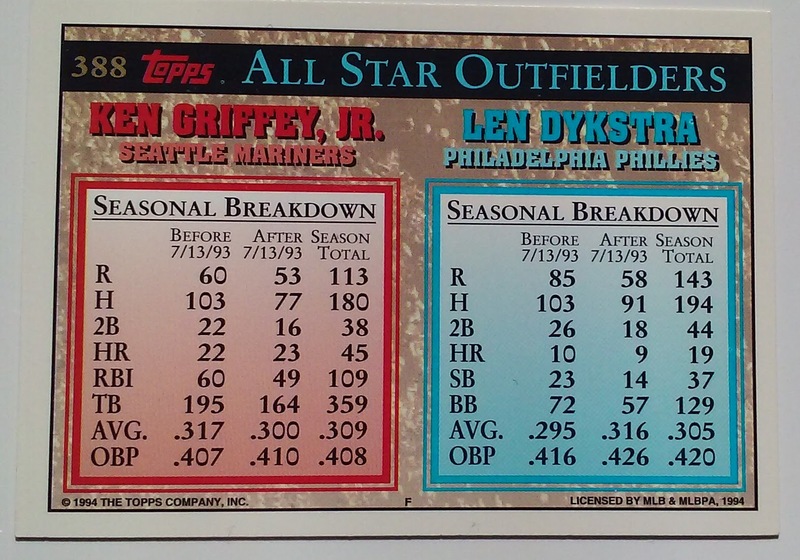 Both Griffey and Dykstra had impressive OBP for the entirety of 1993, I am a little surprised the stat made it onto a 1994 card. Dykstra had a bit of a dropoff in the 2nd half, but his numbers remained impressive. Dykstra finished 2nd to Barry Bonds in the 1993 NL MVP Voting, while Griffey came in 5th in the junior circuit - despite having the 2nd best WAR (8.7) which led AL position players. I am going to try and cover a couple of these players prior to the HoF announcement in January. At a minimum I expect to put together columns on Billy Wagner, Hoffman, and Ballot Snub Chan Ho Park. There are 17 holdovers from the 2015 ballot giving us a total of 32 candidates. Some of those folks got mentioned in our 2015 HoF Ballot coverage which is can be found here. Starting out with a couple of the Update cards. 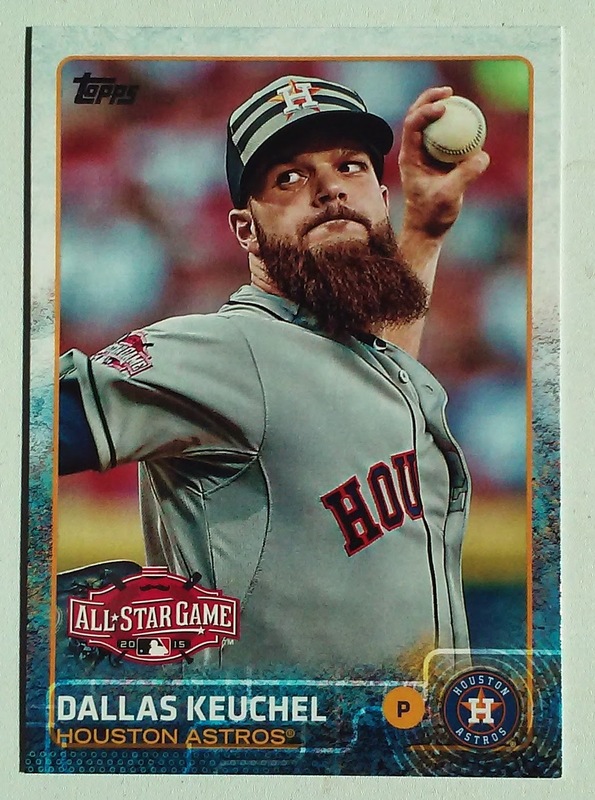 Keuchel is the man who became the ace of the Astros. 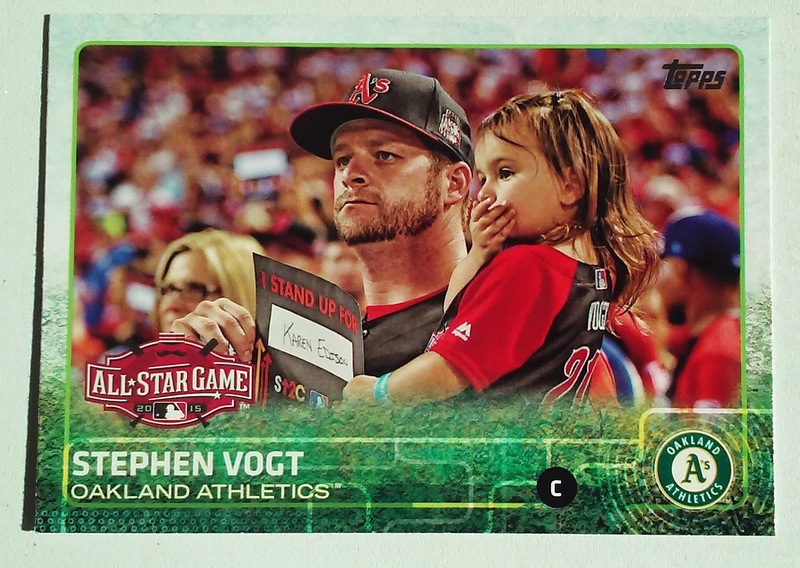 I am much happier with the shot selection for the 2015 All-Star cards. 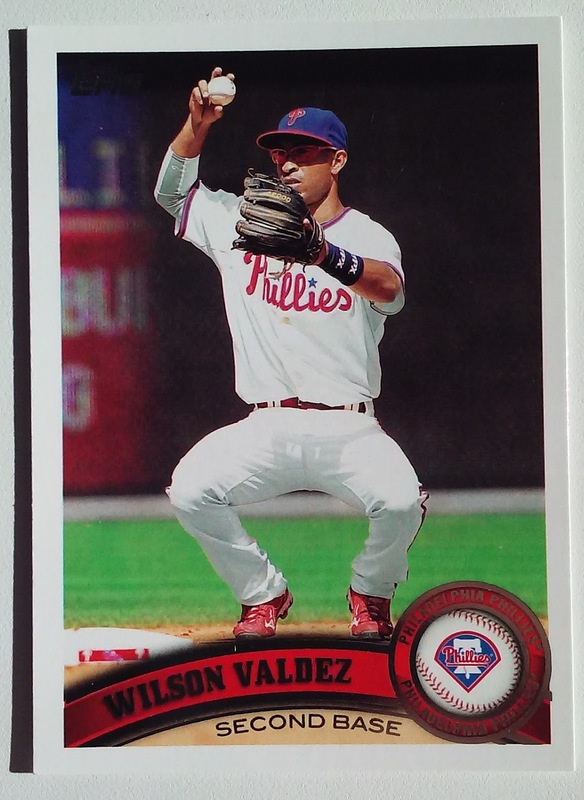 A year ago I think Topps was restricted to Practice Day photos, and there didn't appear to be enough selection. Before we spent the entire postseason hearing about Daniel Murphy, we spent the duration of the stretch run hearing about Yoenis Cespedes. 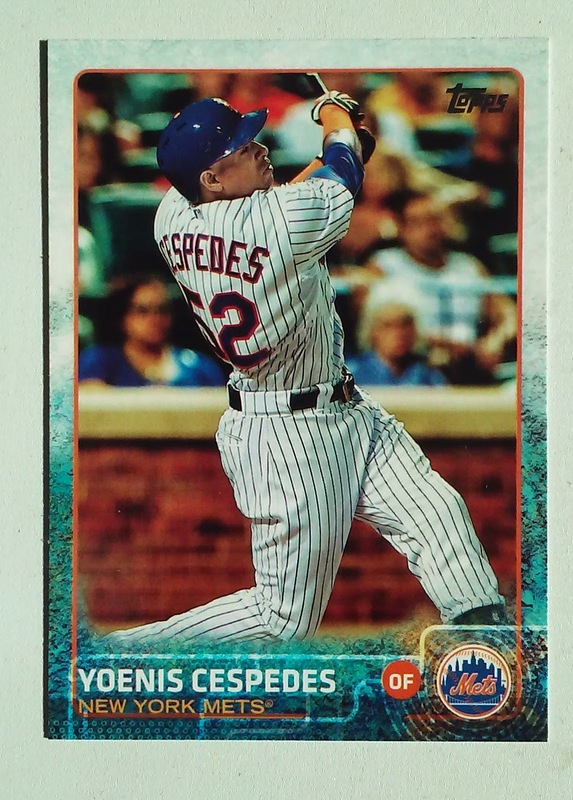 The Cuban outfielder is a Free Agent and this may be one of the few cards issued of Cespedes as a Met. Another All-Star card, this is an interesting shot of A's catcher Stephen Vogt with I assume his child. The two of them are holding a placard for MLBs Stand Up 2 Cancer campaign. These are this years special Chrome Cards. One advantage of photographing over scanning for these is you can capture the sparkles at a variety of angles. 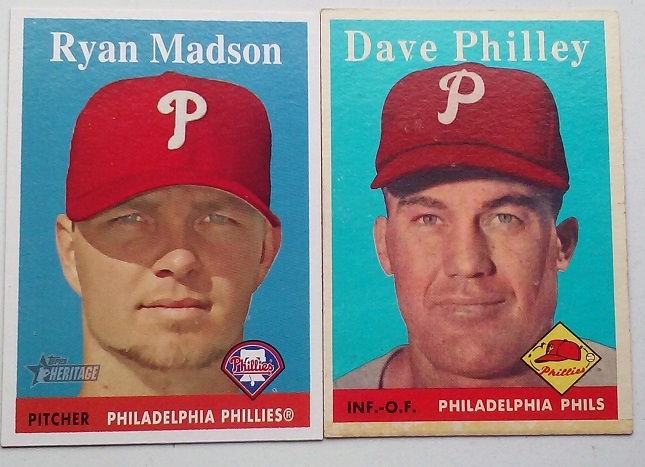 Three Pictures of the same card could have quite different results. The filled in "Future Stars" tag, shown here on the Eddie Butler Card, looks a bit better on the Chrome Cards than on flagship - You can actually read the tag on the Chrome Card. The Ross card is a parallel out of one of the base packs. Whatever Works for Craig Biggio is his dirty helment. 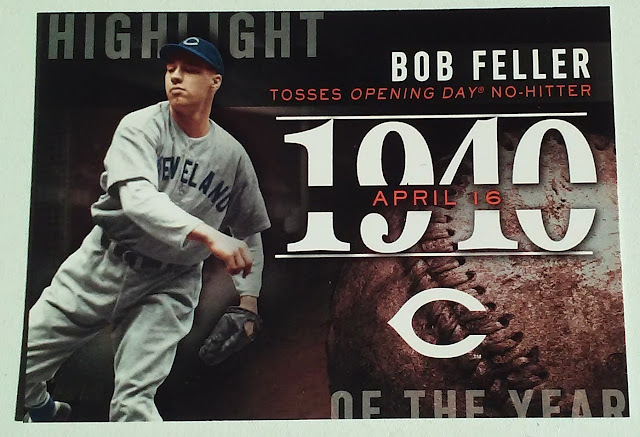 The Bob Feller card above will likely get covered in a future No-Hitters posting. 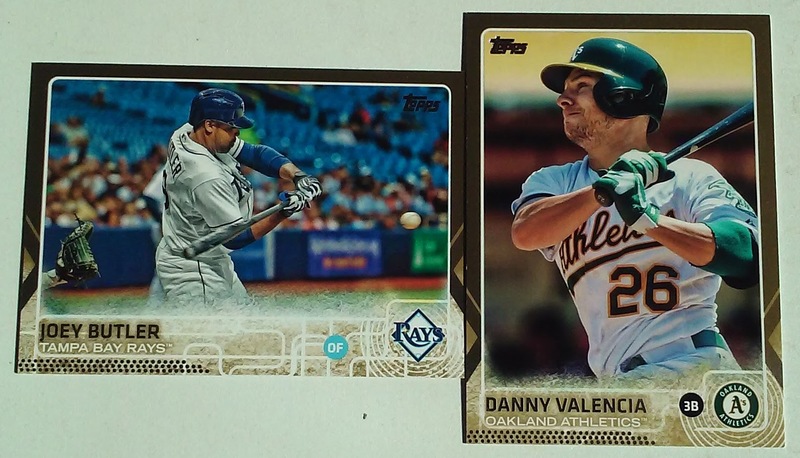 Gold Cards from flagship - both numbered to 2015. Apparently Dual RCs are in Update. I don't recall seeing these in the first 2 series of 2015T. 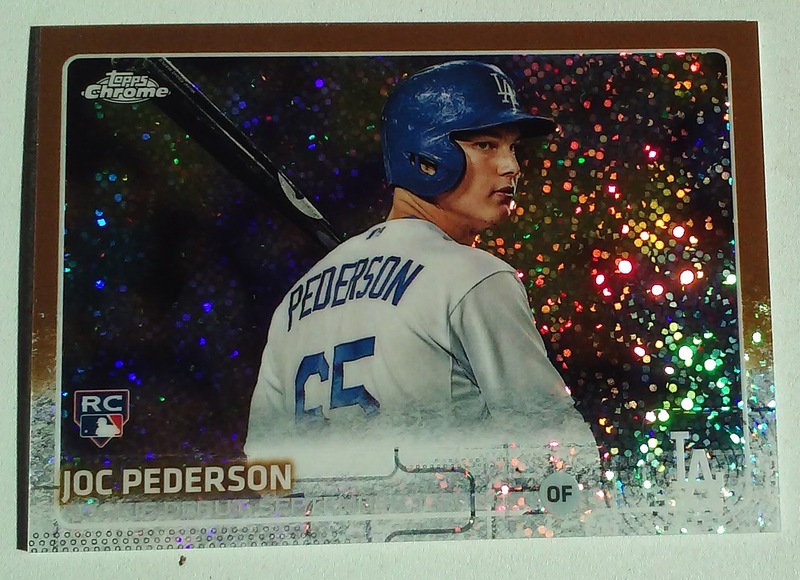 This is one of the Gold Versions of Chrome Update - numbered to /250. 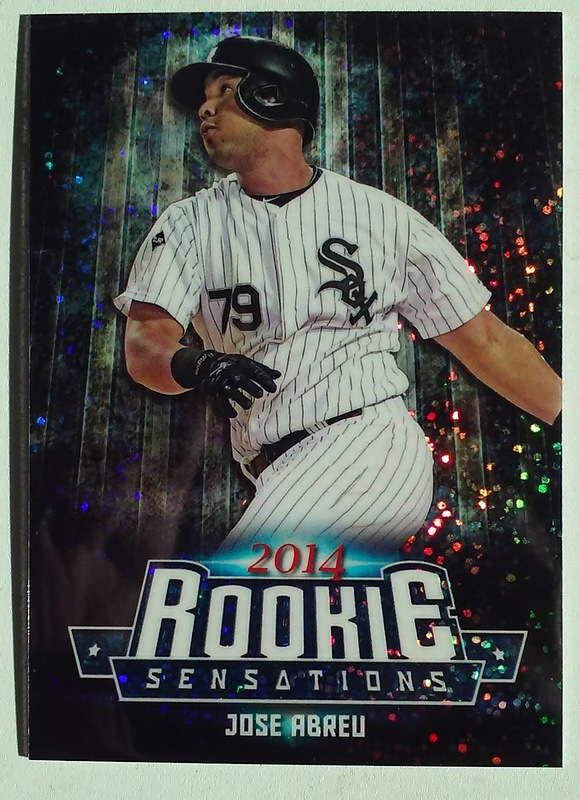 I believe Rookie Sensations is the common insert for Chrome Update. 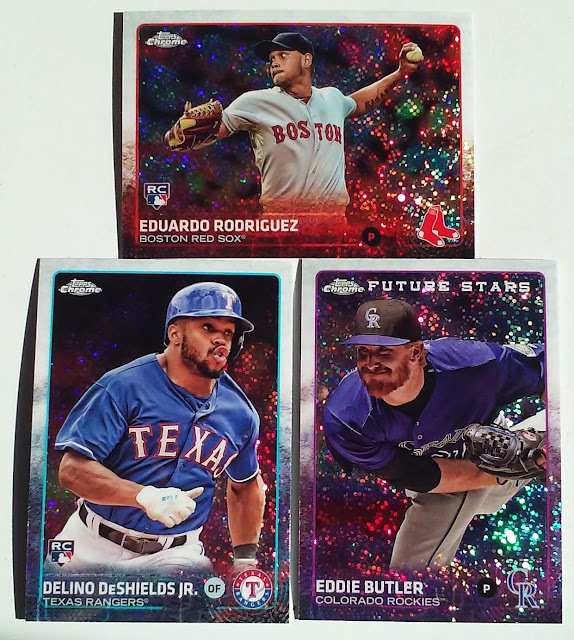 I pick up a couple of packs of Update each year, adding these few packs from the MegaBox along with the 8 ChroUp cards will probably conclude my new pack purchases for the year. I was in a crazy mood for this years Fan Authentics show. I picked up lots of stuff but wasn't looking for anything special. Most of my time was spent in Dime Boxes but I also dedicated a fair chunk of my trip to BuyBacks - which I think were mostly from 2015T Update. Here are some highlights, If time permits I may come back at a later time and give some of these cards more analysis. Buybacks made up a big part of my day1 finds. 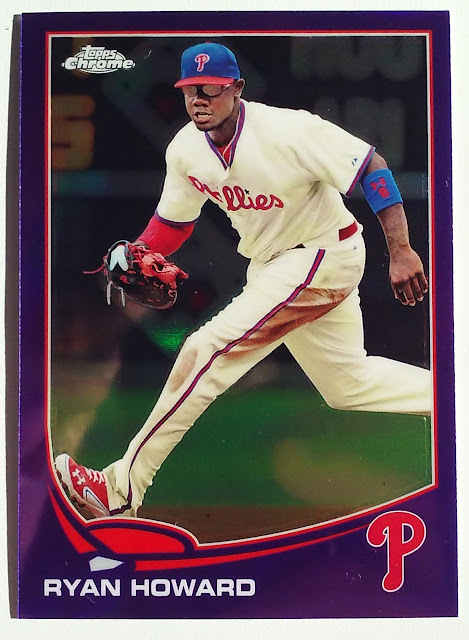 I handn't picked up many Phillies Buy Backs and I believe this Pancho Herrera is my earliest. This card went for 50 cents or a Dollar. Collecting goal may be to pick up a Phillies BuyBack from each year of Topps. Even found Buybacks of Hall of Famers. 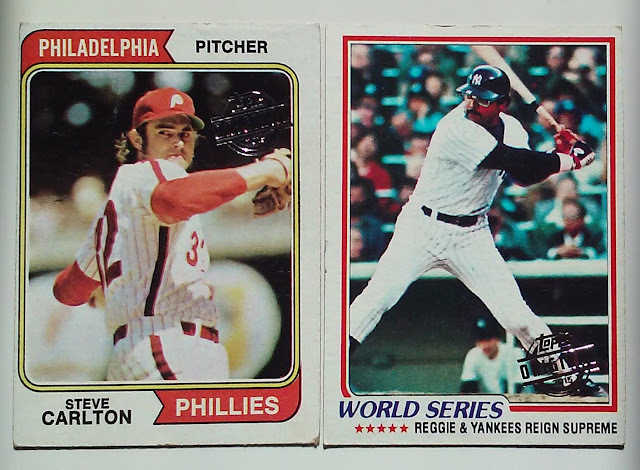 Each of the above 70s era cards went for $2. Found 3 buybacks from one of my favorite early sets. 50 cents or a Dollar on each. 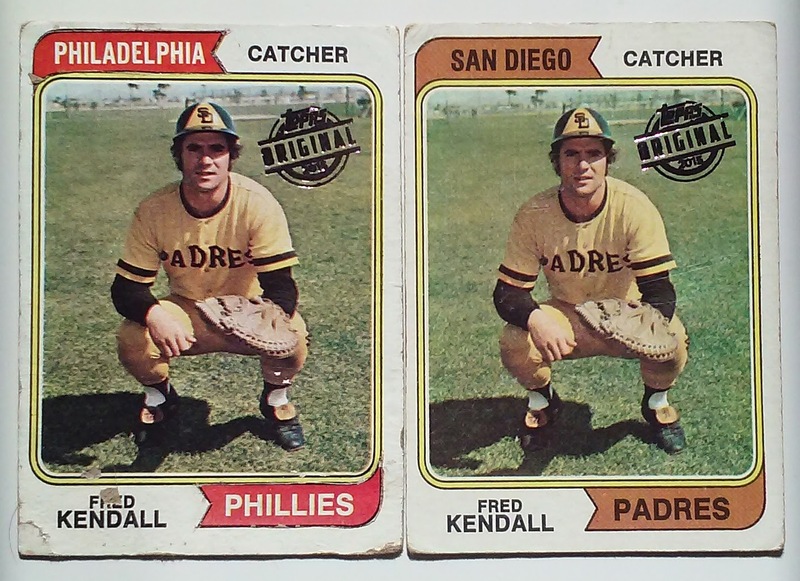 Found lots of 1975T buybacks. Most are destined for Night Owl territory, but Kaat is likely staying in the Phungo collection. 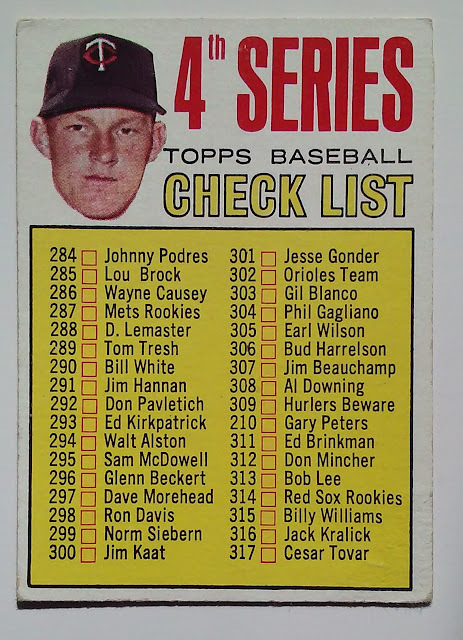 These are the 1975T BuyBacks, Twitchell will stay local, the rest are destined to travel. 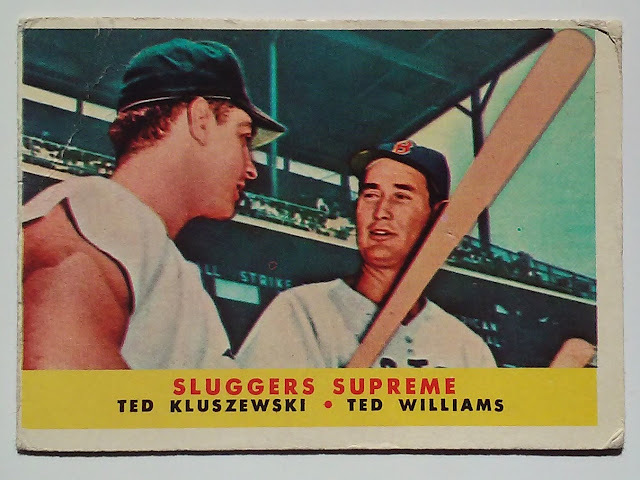 Picked up the Ted's card for $9. Focusing a bit on 1967T a bit getting ready for 2016 Heritage. Curious if the Checklists which have been left out of recent editions of Heritage will return in the upcoming release. 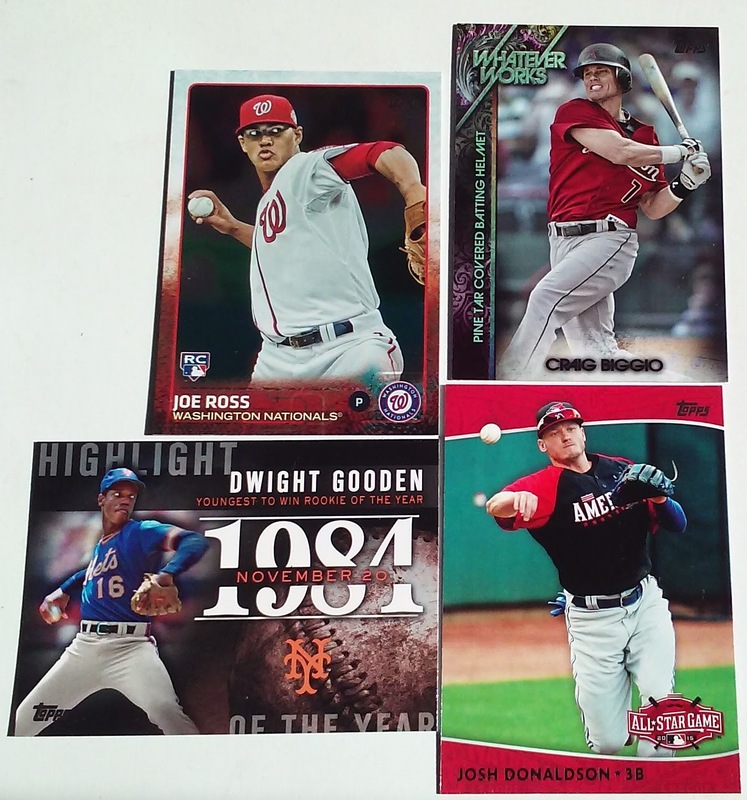 The presents of a player on the card may factor in Topps decision. 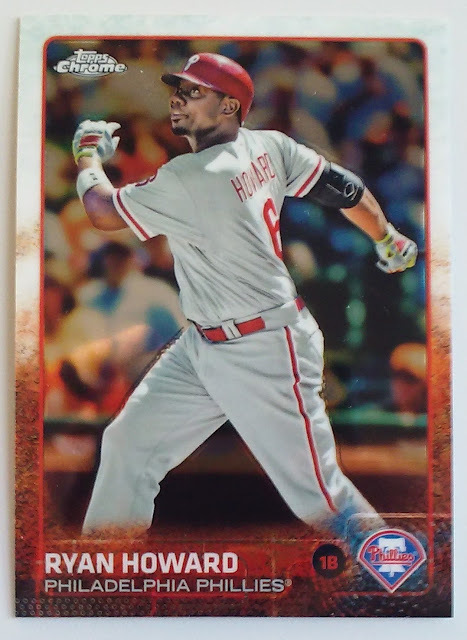 I am not sure that I was supposed to get this but, they were handing out free autographed Dom Brown RCs when I entered the Show on Friday. 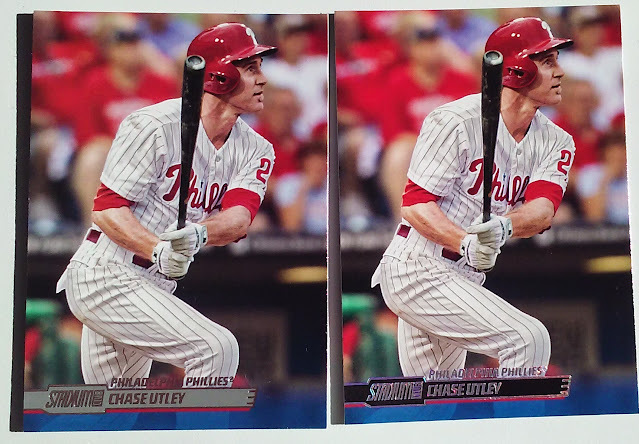 This is an index of our Chase Utley Card related Postings. This years World Series made it into November, by my count it is the fourth time this season has extended into the 11th month of the year. The previous years were 2001, 2009, 2010 and 2015. 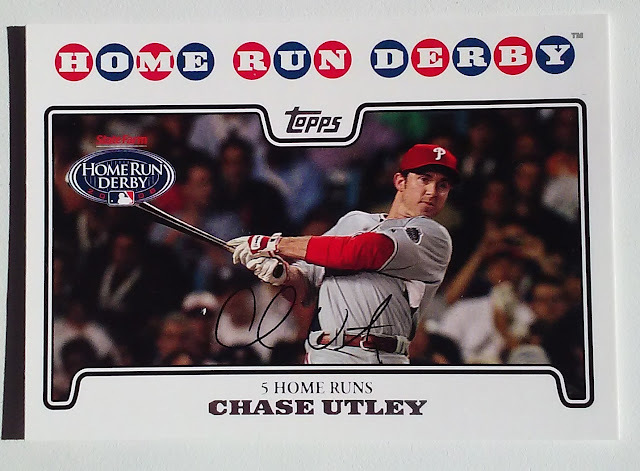 Last week Curtis Granderson added his name to the list of players who have November Homers, a list that is headed by Chase Utley. 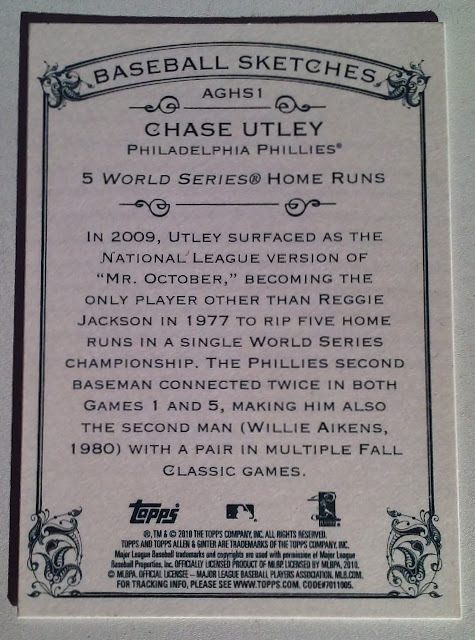 During the 2009 World Series Utley hit five Homers, three of which occurred in 2 November games in Philadelphia. Home Runs 4 and 5 were both hit in Game 5, the most recent World Series Game won by the Phillies and the most recent Series game hosted in Philadelphia. Team Phungo was happy to be at that game and you can read about that very enjoyable night here. The flip side of the card goes into a some additional details including the Mention of Mr October, Reggie Jackson, who is the only other player to previously hit five homers in a Series. This card is a member of one of my favorite collections: The Phungo Game Collection which is the narcissistic set of cards devoted to games that Team Phungo was fortunate enough to attend. 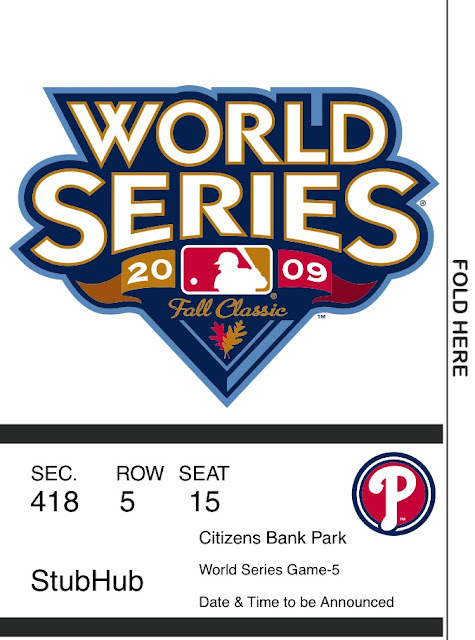 Above is a snapshot of the e-ticket I picked up for the game. I miss hard tickets, but do realize that the time marches on. I do have a paper ticket to this game but it isn't the same as the ones issued by the teams/league. The Index of Phungo Game Cards can be found here. Earlier today I woke up to the sad news that Tommy Hanson Had died. This picture was taking during BP On July 7th 2010. The Braves defeated the Phillies 7-5, Hanson did not play in the game. My enthusiastic game report can be found here. If I recall correctly the retiring Tim Hudson was working closely with the young Hanson that night. 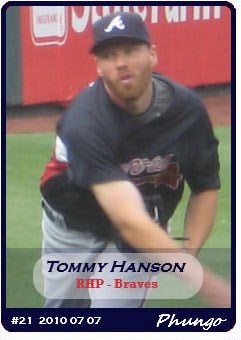 Tommy Hanson earned one other blog mention - As a notable Braves prospect he made it into the 15 card Rookie Performers insert set of 2009 Heritage High Numbers. 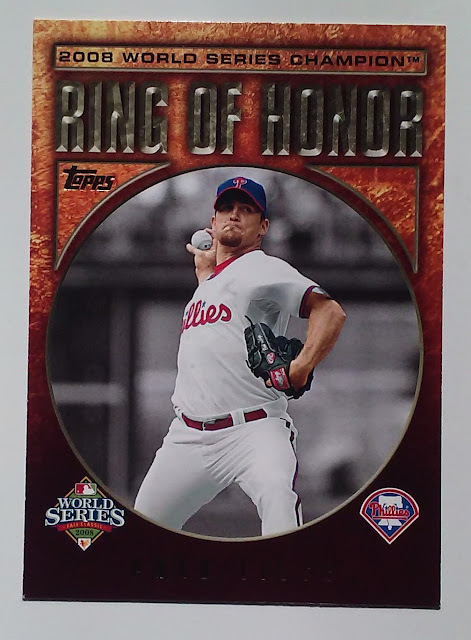 The KC Royals victory over the Mets in the World Series gave former Phillies pitcher Ryan Madson his 2nd World Series ring. Madson got into 3 World Series games with the Royals and was credited with the victory in game 4 on Saturday Night. Reds and Angels fans may not be as happy with Madson who battled injuries with both clubs and didn't make a major league appearance between 2011 and 2015. 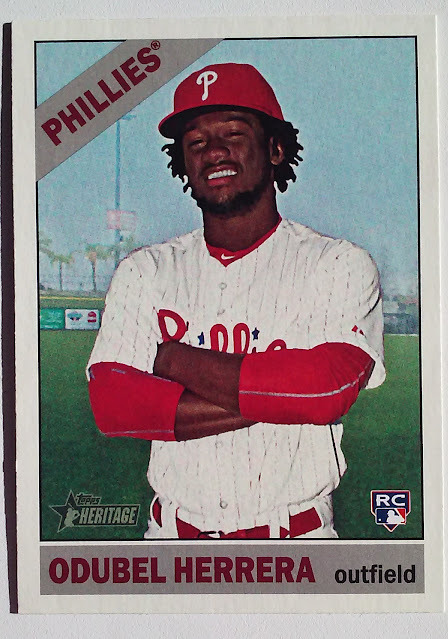 For us Phillies fans it was a rare bright light in a bleak year and a reminder of better times which don't seem that far in the past. In the original 1958T set the #116 spot was occupied by Pinch Hitting specialist Dave Philley. The franchise is pretty much the extent of the player similarities. The Heritage recreation is pretty faithful, The different shades of blue and the logo change are the easiest things to spot. Also in the original 1958 Topps there are at least 3 different variations of the club nickname: Phillies, Phils and "Phils." with a period at the end. The flip of the cards confirms the residents of both players as Card #116 in their respective sets, Near as I can tell the only other thing the two men have in common is a weight of 195 lbs.